Lebanon’s water resources are severely polluted. Domestic and industrial sewage goes largely untreated and unsustainable agricultural practices worsen the situation. Lebanon’s major rivers have very high levels of bacterial contamination due to the release of raw domestic sewage, which poses a real threat to public health. The uncontrolled disposal of solid waste also leads to water pollution as a result of the leaching of chemicals. Chemical pollution of surface and groundwater from industrial discharges is also common. Untreated wastewater containing heavy metals is frequently released, while leaking underground gasoline storage tanks and uncontrolled dumping of waste oils and petroleum by-products are also common. Lebanon’s coastal waters are heavily polluted by wastewater released from domestic sewage outfalls, industrial wastewater effluents, coastal agricultural runoffs and large seafront dumps (at the Tripoli, Bourj Hammoud, Beirut, Saida and Tyr dumpsites). 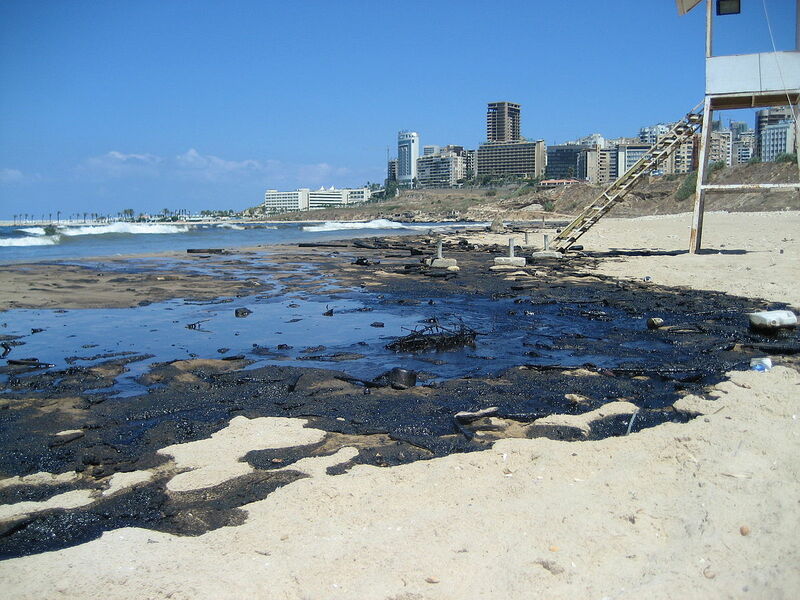 Oil spills (particularly the major spill after the 2006 war with Israel) and coastal thermal power plants (at Beddawi, Zouk, Jiyeh and Zahrani) form further sources of pollution. Several studies on coastal and marine waters in Lebanon have found very high levels of contaminants – particularly close to the three major cities Tripoli, Beirut and Saida – including heavy metals, which are toxic to both aquatic organisms and humans. 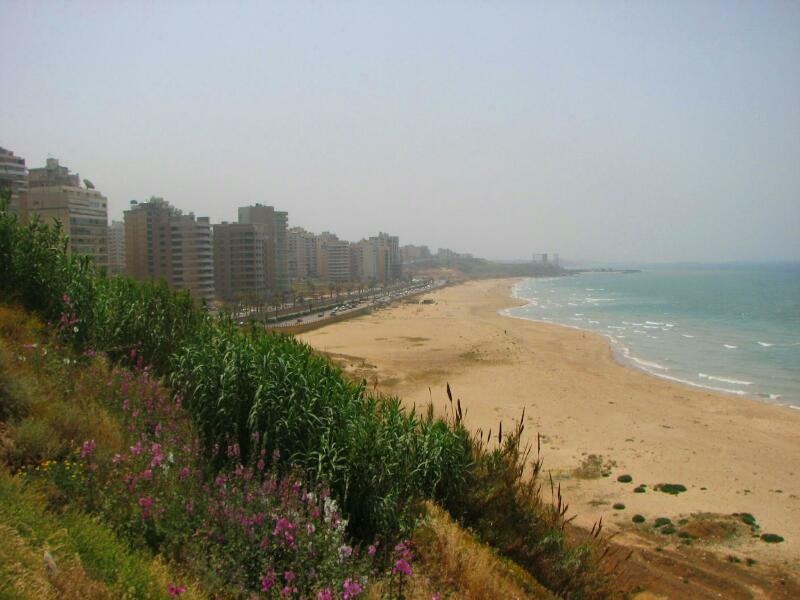 The beach at Ramlet al Baida near Beirut where the Al Ghadir wastewater treatment plant is located in Lebanon. Photo: Blingbling10. The intensive use of fertilizers and pesticides in agricultural practices, especially during the dry season, has led to nitrate leaching into the soil and contamination of the groundwater system with high concentrations detected in groundwater in the coastal plain and Bekaa Valley. With farmers relying on wells for irrigation, health and environmental concerns are increasing. Moreover, raw wastewater is reportedly being used for irrigation in several regions including Akkar and Bekaa, and it is likely that farmers across the country resort to this practice when no fresh water is available. In the Litani River basin, for example, water resources are heavily polluted. Untreated sewage from the towns and cities, extensive garbage dumping, and the release of uncontrolled industrial wastewater and agricultural runoff (including fertilizers and pesticides used in the Bekaa Valley) severely affect water quality in rivers and streams, but also pollute the groundwater. In many places, the water is also contaminated with heavy metals. In addition, water quality sampling from the Canal 900 (which transfers around 30 MCM/yr of water from Lake Qaraoun to irrigate farmland in the Bekaa Valley) indicated elevated nutrient levels, which is causing eutrophication and algal proliferation in the canal. This in turn contributes to slowing the water flow, clogging irrigation systems and causes a dreadful stench which farmers and inhabitants complain about. Pollution is one of the reasons that the canal operates at only around 30% of its capacity, irrigating only 1,900 ha of the originally planned 7,000 ha of irrigated land (see also ‘Water Use’). Excessive and uncontrolled groundwater pumping, especially during summer, has caused a severe drop in the water table, which has in turn caused seawater to infiltrate the groundwater along the coast, particularly in the Jiyeh and Damour regions. When groundwater becomes salty, drinking water quality is directly affected: in parts of Beirut and surroundings, tap water is salty and unsuitable for consumption. Agricultural water supplies also suffer, which impacts farmers who rely on groundwater as a main source of water. The high salinity in the groundwater can even affect the foundations of buildings. Dib and Issa, 2003. ‘Safety of Fresh Produce: Bacterial Risk Assessment of Irrigation Water and Soil.’ Lebanese Science Journal, 4(1). ; The Daily Star. 2014a; AFED, 2014.